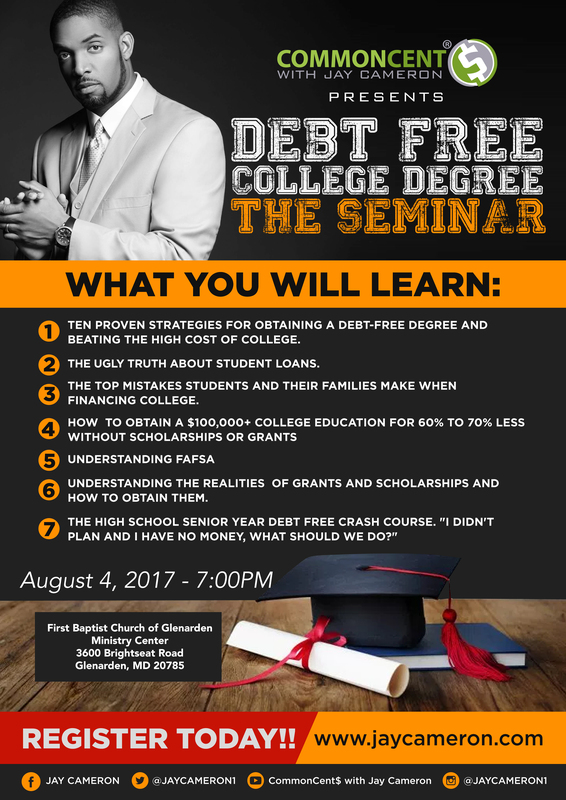 For more than six years, Jay Cameron has been teaching students how to earn their college degrees 100% DEBT FREE! He’s back with an updated version of the original seminar. Complete with new strategies and information, this seminar is informative and inspirational. Every year, millions of families will be faced with funding college. The uncertainty of the college financing process can intimidate those who are not prepared. In an unpredictable economy, it is critical for college students to make wise financial decisions. Millions of students overpay and take on a lifetime of debt for college. Don’t be in that number! The return on the investment in this seminar is tremendous! Within the first two sessions, you will learn how to save thousands of dollars in college expenses with a simple, systematic approach (even without scholarships or grants). By the conclusion, you will learn strategies that can save 60% to 70% (or more) off of the “sticker price” of college. Learn how to develop an Education Business Plan that establishes a road map for reaching your educational goals. 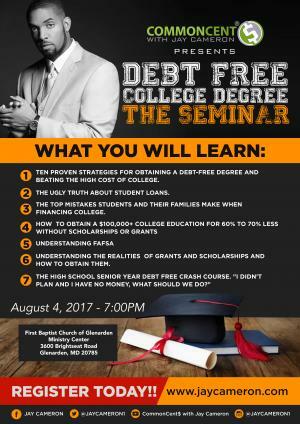 Debt Free College Degree – The Seminar provides information that helps families avoid catastrophic college financing mistakes. The knowledge shared will prepare college students and their families for long-term success. Why a DEBT FREE College Degree? With student loan debt surpassing credit card debt and exceeding one trillion dollars, absorbing tens of thousands of dollars in debt leaves students and their families vulnerable to a host of risks. Student loans generally CANNOT be discharged in a bankruptcy? Medical professionals and attorneys who default on their student loans can lose their license to practice. Tax refunds, social security and disability payments can be garnished if a student or a co-signer defaults. These facts are not shared when many families sign up for financial aid assistance. A small investment in this seminar can pay dividends that will last for generations. With so many activities and items designed distract us from making wise financial decisions; it is up to each person to become educated about the college financing process BEFORE signing the dotted line. Get Educated BEFORE You Get Educated! Students currently enrolled in college. Students and families preparing for college. Those who want to become knowledgeable about the college financing process. How to obtain a $100,000+ college education for 60% to 70% less without scholarships or grants. Dispelling the MYTHS about the college financing process. The ugly truth about student loans. The TOP mistakes students and their families make when financing college. 10 proven strategies for obtaining a debt-free degree and beating the high cost of college. Learn how to pay off those lingering student loans. Understanding the realities of grants and scholarships and how to obtain them.